I have now visited three places where Joseon dynasty scholar-official Song Si-yeol has made his mark. In none of the places did I register the connection until after returning to London; in two of the places I never got to see the mark he left (there wasn’t enough time on the schedule) and in the third place I do not know if I saw it or not. Uam Song Si-yeol (우암 송시열) was born in Okcheon, Chungchongbuk-do, in 1607. As a result of 50 years of service to the court at a very interesting time in Joseon dynasty history his name appears over 3,000 times in the dynasty’s official record (the Sillok) – a record. An anti-Qing hawk, he was one of the main architects of the Neo Confucian ascendancy in the 17th century. In Kang Jae-eun’s book on Korean Confucianism, The Land of Scholars, Song Si-yeol is the chief villain, an ideological purist who held back Korea’s development. Song studied under the tutelage of Yulgok Yi I’s top disciple, Sagye Kim Jang-saeng, and in 1633 he got the highest score in his first civil service exam. 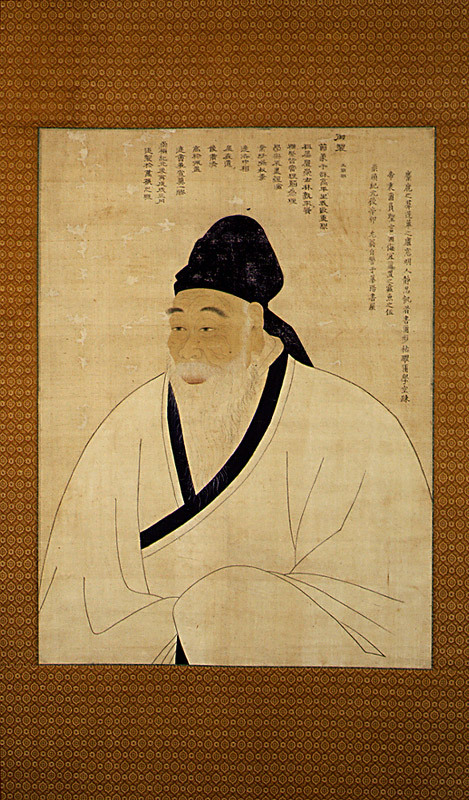 In 1635 he was appointed tutor to King Injo’s second son, the future King Hyojong, a post once occupied by Yun Seon-do. Like Yun Seon-do, he was devastated at Injo’s surrender to the Qing in 1637, and probably took it more personally than Yun because he had been with the king in Namhansanseong while Yun had not. Like most scholars, he spent times out of favour with the court either in voluntary or compulsory internal exile, his first withdrawal from public life starting after that surrender. On the death of King Hyojong in 1659, Song got caught up in the debate about the appropriate mourning period that the late king’s stepmother, Injo’s second wife queen Jangryeol, should observe. Song won the battle, but the issue increased the factionalism in Joseon politics for the rest of the century. He retired from public life at the age of 74 and retreated to the Hwayang Valley in Goesan-gun, Chungchongbuk-do. Here he built a pavilion (the Amseojae 암서재) in a stunningly beautiful location by the river. If ever there were a place where nature does not need adornment, it is here. The scholar had found a perfect place for quiet contemplation with all the elements you need for a Korean garden: rocks, water, trees, landscape and hills in the background. No doubt there was a damn fine view of the moon, too. But he did not withdraw totally. In 1689 he got involved in his final controversy. King Sukjong’s second wife Queen Inhyon was to adopt the son of the royal concubine Jang Hui-bin so that he could become crown prince – the future King Gyeongjong (r 1720-1724). Song Si-yeol opposed the move and lost his final argument. He was exiled for the last time. It was as a result of this exile to Jeju-do that I first came across him. Like Yun Seon-do (or maybe because of him – though Yun died 18 years earlier in 1671), Song Si-yeol stopped off in Bogildo on the way to his exile in Jeju-do. I can imagine him staying as a guest of Yun Seon-do’s children and grandchildren, comparing his fate with that of the older Yun. It seems though that he kept himself to himself for much of his time on Bogildo: he took himself off to the rocks on the island’s most easterly promontory and chiselled a poem onto the rock face. The site is now called Geulssenbawi (글씐바위) (“Inscribed Rock”). My trip to Bogildo was inspired by Yun Seon-do, and although I knew that somewhere on the island there was a rock with an inscription by a famous scholar on it, I did not make time for it. An eighty three year old man is on the long road of angry waves of hardships. Only one word has become a huge crime and it caused three times of exile, how pathetic it is! Staring at the sun in the northern sky, but all I can trust now is the tailwind. The king’s old grace is left in the sable bestowed by him: I am still deeply moved and weep alone. The “sable” in the last line is a reference to the fur coat that King Hyojong (r. 1649-59) had given him thirty years earlier. So the story goes, Song Si-yeol had originally declined the expensive gift, preferring austerity and frugality, even though the winter was bitterly cold. But Hyojong said that they’d need to wrap up warmly if they were to lead the Joseon armies northwards and give those Qing barbarians a good thrashing, and this persuaded Song Si-yeol – a fellow Qing-hater – to accept the gift. Song is reminiscing that although one word caused the young King Sukjong to banish him, his grandfather King Hyojong had been much more generous. These lines were the last time that Song would wield his chisel. His sentence of exile would soon be commuted to death, and a few weeks later he took poison. Throughout his long life Song Si-yeol had become known as a virtuoso calligrapher in stone. One of his more romantic commissions was to commemorate a legendary moment in ancient history. On writing up the account of my visit to Buyeo-gun, site of the ancient Baekje capital of Sabi, I discover that Song Si-yeol honoured the palace women who committed mass suicide when the kingdom fell to the combined armies of Tang China and the neighbouring Silla kingdom in 660 CE. The women had thrown themselves off a cliff that later became known as Nakhwaam (falling blossom rock) into the river 60 metres below. Song Si-yeol inscribed the characters for Nakhwaam (落花岩) on the cliff face. Unfortunately the engraving is only visible from the water, unless you are a competent abseiler or a falling palace maiden. In Tongyeong, Song is responsible for inscribing an epitaph (the Chungryeolmyobi Takboncheop 충렬묘비 탁본첩) to Yi Sun-shin in his memorial shrine (historic site #236). The shrine itself was built on the orders of King Seonjo in 1606, and King Hyeonjong gave it the name Chungryeolsa (충렬사) in 1663. This memorial stone was erected in 1681, in the 7th year of King Sukjong’s reign. The text of the epitaph was composed by Lee Hang-bok. Having engraved the official text on the front of the tablet, Song Si-yeol appended his own tribute on the reverse, signing it with his name in Chinese characters, 宋時烈. I visited this shrine in 2012, but failed to register the identity of the famous engraver. Given the limited time I have in Korea every year (around 10 days) it’s unlikely that I shall ever get to revisit the places I have already seen and “do” them properly. So I’ll have to be on the look-out for Song Si-yeol’s handiwork in other places. Fortunately he seems to have been quite prolific with his chisel. With my limited (ie English) search skills I’ve found evidence of his inscriptions / calligraphy in Seochon, Seoul; Gapyeong-gun, Gyeonggi-do; Hapcheon-gun, Gyeongsangnam-do; and Namhae-gun, Gyeongsangnam-do. There’s bound to be a lot more sites on top. Many thanks to Kim Insoon for additional research and assistance with translation.